16 March 1963 – appeal launched and booklet produced with a message from the Bishop of Chichester Roger, and message from the Vicar of Rottingdean D Milva Walters, & Frederick Massey of Saltdean. 6 December 1963 - St Nicholas Day at 3pm gathered at the spot of the high alter of the new Church will be. 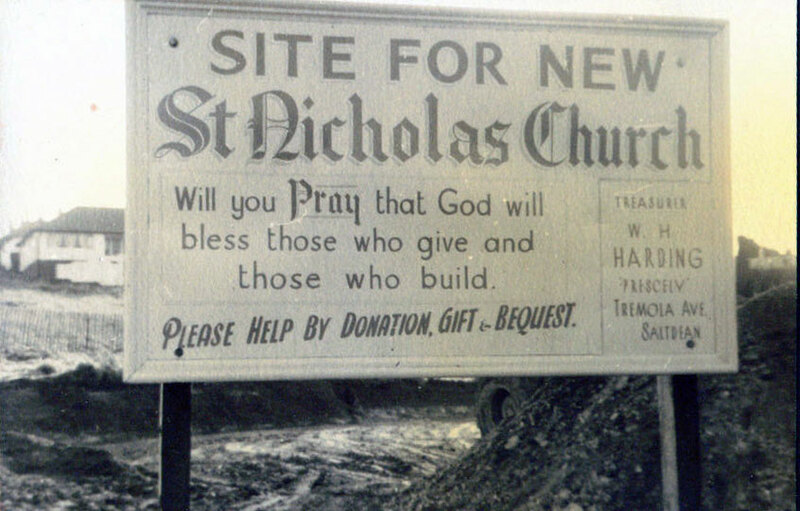 Mr R C Neville said ‘On behalf of my mother Mrs Dorothy Neville and of the Saltdean Estate Company, we are pleased to give this site for the erection of a new Church of St Nicholas Saltdean. May God bless your work.’ Mr C W Dear called on the oldest surviving member of the Appeal Committee of the original St Nicholas Church Committee to cut the first sod. ‘In the name of the Father and of the Son and of the Holy Ghost, I cut this sod remembering with gratitude the good fellowship of these men and women,who helped to found the Church of St Nicholas in Saltdean and in the sure faith that from this spot, Holy Worship shall be offered to the Glory of God. Amen.’ The Vicar pronounced the blessing. 14 December 1963- St Nicholas Feast a day of snow, frost, cold winds and icy roads. 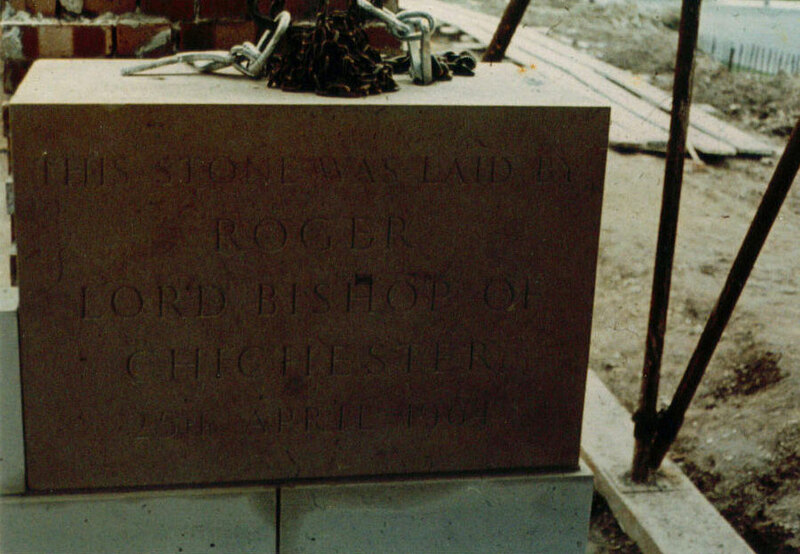 25 April 1964 - Foundation Stone Laying Ceremony. By the Rt Rev the Lord Bishop of Chichester. Headed by the Cross bearers of St Nicholas and St Margaret’s, junior choir, the two church choirs, members of both branches of the Mothers Union, Young Wives, Clergy from various parishes, Church Councillors, Church Wardens, Deputy Wardens, the Red Cross, Women’s Institute, Towns Women’s Guild, Saltdean Residents Association, Boy Scouts, Girl Guides Red Coats from the Ocean Hotel and other local bodies. 14 years ago (1950) the founder members of St Nicholas Church had gathered for a similar ceremony, then there were few houses and the field stretched away to the Downs; now there are houses, streets and shops. In attendance were: Rev Ivor Walters Vicar and Rev Fred Massey Curate, visiting clergy, Church Wardens Mr Gough and Mr Harrow, Deputy Wardens Mr C W Dear and Mr W H King, Treasurers Ivor Jones and W H Harding, Sir Edward Maufe (architect) , Mr Wallis (builder), Mr Lovelock (clerk of works). 20 June 1964 - Clerk of Works, Mr C W Lovelock, showed around a party who had ‘bought a stone’ and Miss Jackie Peterson who opened the mid summer fete. 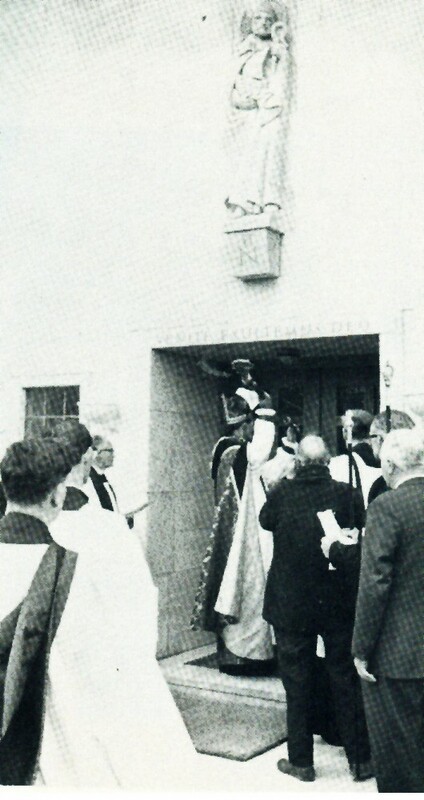 8 May 1965 - Dedication Service - by the Right Reverend R P Wilson DD Lord Bishop of Chichester. In Attendance: Architect: Sir Edward Maufe RA, Builders: Norman & Burt Ltd.
DMI Walters, Vicar of St Margaret’s referred to the ‘daughter church at Saltdean’. May 1965 – Saltdean Women’s Institute – Mrs Sturch congratulated members on the number of Tapestry Kneelers made for the new church of St Nicholas, Saltdean. June 1965 – Midsummer Fair and Rose Show - Countess de la Warr of Fishersgate near Bexhill opened the fete. Mayor Alderman Jim Taylor presented the prizes. 26 September 1965 - First Harvest Festival.